Are you enjoying your hop along with the Sweet Tooth girls? They are so talented and super inspiring! Speaking of talented you should be arriving from the fabulously creative Michelle. 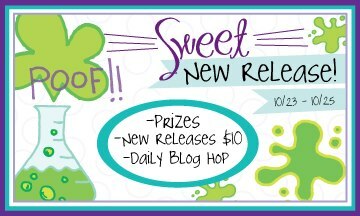 If by chance you are just dropping in to visit you can start the hop from the beginning at the Sweet Stamp Shop Blog. So let's get to the cards huh?! I'll spare you all the details (I know you have places to hop too!) but I did want to point out the coloring technique I decided to use. I smeared several distress inks onto my craft mat and sprayed very generously with water. I then dragged, pushed and pulled my paper through the ink until I was happy. I always do a 4.25 x 5.50 piece because then i can use it for several things. Both of my color combinations were used as paper piecing to color the images. Nicole is generously offering the new stamps sets (including this one) for only $10.00 today. Such a steal!! Lucky for you Nicole is the next stop on the hop so once you get all inspired by her lovely creations you can hop right over to check out the deals. Plus there are prizes being given away over at the blog! The second card is awesome. I love the simple, clean layout. Talk NERDY to me...I love that card. It is just perfect, perfect, PERfect!! Wow! Love your new cards! Bright colors! Nice! That "hello bookworm" is my favorite! Love, love, LOVE how you created the paper/pattern for the worms. Your cards are so CAS and perfect! I love the colours on the worms - they glow! I also love that I see a 'face' in the pile of books, with the bookmark as a tongue sticking out! Super cute! Love the use of the distress marbled paper! Okay - those are just too cute! Love them. wow!! i'm blown away!! the colors in your first card ARE AMAZING!! i want to look at that card all day!! but all of your cards are so wonderful!! you are so talented!! wow! Love the Talk Nerdy to Me card! Brings back so many memories of my teenage years! You just wormed your way into my heart. Amazing cards my friend! The coral and green are such a gorgeous combination. Love the coloring technique you used. What a great set! Love the color of the worms on the first card. I also love all of the clean lines on all of your card. Great job and thanks for sharing. The colors are soooo amazing. I'm going to go back and see how you did it!!!!!!!!!!!!!! Great cards and I like your coloring technique. lol these cards have a great sense of humor. love the little hints of glitter. thanks for sharing. Gorgeous girl! I love all 3! Hope you're well & happy!